There is something magical about little girls in sparkly dresses, with flowers in their hair and whimsy in their eyes. Many little girls love fairytales, and it is a memory in the making when they get to create a fairytale of their own. Recently, I got to create my own enchanted woodland and capture some whimsical moments with three very special little girls. For a while, these girls got to be the fairy princesses of their own kingdom, together adding a little magic to the world. The session was done for two sisters and their cousin, and I really enjoy making sessions a family affair. This always works out well because the parents can share the cost of the session and products while the kids get to enjoy a memorable experience together. These parents came to me with a sweet idea, too! While I have over eighty dresses that the girls can choose from for their session, the parents presented each girl with her own sparkly dress for the photoshoot. When we wrapped up the session, they surprised the girls and told them the dresses were theirs to keep! It was a fun moment as the girls realized this meant the fairytale could continue and come home with them. Our fairy session took place in my studio where I combined a little creativity and a lot of imagination to create an enchanted forest. I used a beautiful, floral backdrop so the girls were able to immediately feel like they were part of the fairytale. I had a toadstool, a bench, and a “stump” for the girls to sit on, but one of my favorite props was the “swing” I built. I wanted to create something that would look and feel like an actual swing yet would also act as a portable and safe alternative to a real one. I found my solution by using two stools, a piece of wood, and attaching ropes wrapped in flowers on either end. The result was a beautiful “swing” that the girls could sit on and enjoy, without any concerns with safety or mobility. Each picture was accentuated by a fun and whimsical detail, and the girls had a lot of fun with the props. There were lanterns, wands, and candles to add a little light and sparkle, and there was even a frog prince for them to swap little kisses with. By the end of the session, our entire studio had become a fairyland! I’m dedicated to having each session be a fun experience for the kids and I encouraged the girls to share their ideas with me. Even when their ideas were different than what I had in mind, I was more than happy to accommodate. They brought in my stuffed unicorn for some pictures, danced around in their dresses, and even incorporated a lollipop. The final edits came with a little photoshop afterward, where I added their fairy wings and played with the colors, but ultimately the photos look mostly how they did at the set. Soon winter will melt away and leave spring in its wake—the perfect season for a fairy session. 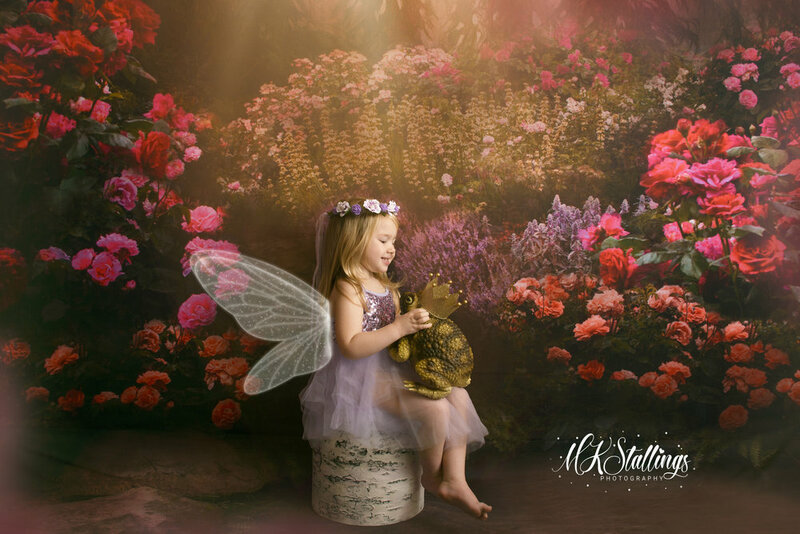 Many little girls dream about living in a fairytale, and you can add a little magic into their lives with a personalized session. The experience will be unforgettable, and the pictures will be something to cherish for a lifetime. 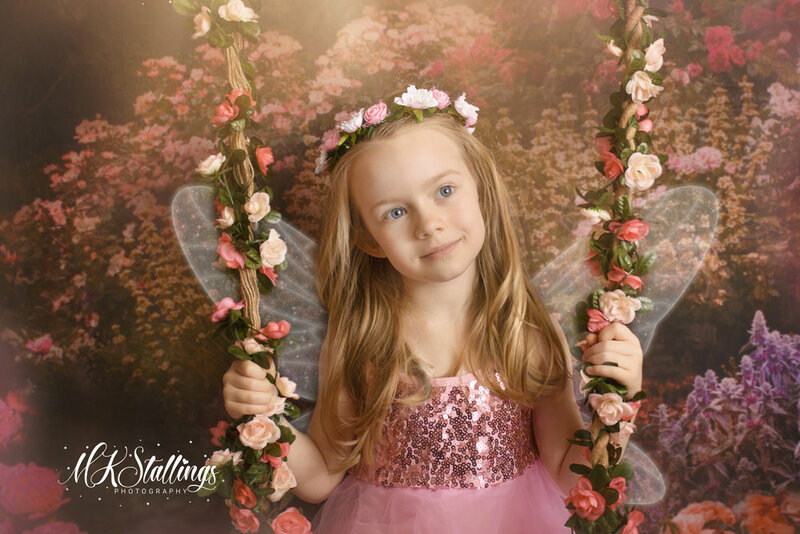 Find out more information and book your very own fairy session here.